What is Synthetic Tension-Free Vaginal Tape (TVT)? TVT is made of polypropylene, a type of plastic also used in packaging and electrical equipment. It is nonreactive, has elasticity and toughness, and retains its shape. It has been used in surgical operations since the 1990's. When a new medical treatment becomes available, a number of clinical studies are completed into its safety and success. The National Institute of Care and Excellence (NICE) review these studies, and provide guidelines to both patients and NHS healthcare professionals, to help them make the right treatment decisions. 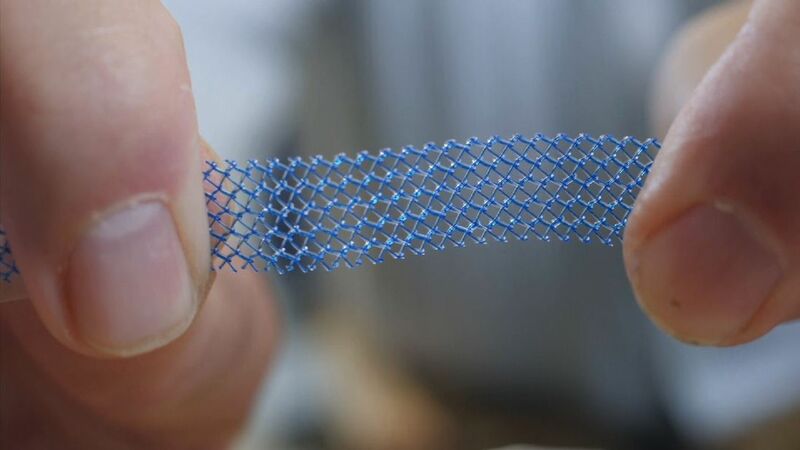 How Is Mesh Used in Pelvic Surgeries? In women suffering from urinary incontinence or from a pelvic organ prolapse, the first line of treatment is a number of lifestyle changes - including pelvic floor exercise and weight loss. If this programme is not kept to, and the symptoms do not improve with exercise, then surgery may be discussed. In incontinence surgery, mesh can be implanted to act as a sling to support the urethra. This reduces urine leaking when the bladder is put under pressure when exercising, laughing, coughing etc. Tissue will grow through the mesh to hold it in position. In prolapse repair surgeries, mesh is used to suspend the prolapsing organ in its natural position. This prevents it from dropping further and can allow normal function to resume. Alternative surgeries include using biological slings or bulking procedures. To date, studies show the risk to women from mesh has been comparatively low. However, as the risks are so severe, public opinion is now changing. Organ perforation - If the mesh moves and cuts through the wall of one of the pelvis organs, it can allow its contents to leak into the cavity of the pelvis. Vaginal or uterus injury - If the mesh erodes through the vaginal or uterus wall, it can cause fertility issues. Inability to empty bladder or bowel - Some women suffer with issues fully emptying their bladder or bowel following the surgery. Pain - Any pain experienced more than a week following a mesh operation, may be due to the mesh eroding into the surrounding tissue. Haemorrhage - When a blood vessel is damaged, blood can leak into the cavity of the pelvis. Mobility - Some women have suffered issues with the use of their legs, as the mesh causes pain when they move. Following a number of high profile campaigns, including the Sling the Mesh campaign, a review has begun into the use of mesh in pelvic surgeries, led by Junior Health Minister, Baroness Julia Cumberlege. During this review, there is a ban on the use of mesh in surgical operations as the review team see no significant benefit of using mesh that outweigh "the severity of human suffering caused by mesh complications." It is important to be aware that the current decision is not a total ban of mesh. It will still be available as a last resort for those patients that have considered their options and believe it is the only solution to improve their quality of life. It is also still able to be used in bowel surgeries such as rectopexy. Campaigners are also hoping that a review of the NICE guidelines regarding mesh will be brought forward from 2019. With NICE currently recommending that mesh, for some pelvic surgeries, "should only be used in the context of research." Many women suffering from mesh complications have begun legal proceedings against their surgeons and the NHS. The mesh is being considered 'the new thalidomine', and it is thought that there will be massive compensations provided. What Are Your Options If You Are Suffering? If you are affected, speak to your GP or surgeon as soon as possible. Mesh removal surgery is available for some women, depending on the location of the mesh and severity of your injuries. If you can complete traditional pelvic floor exercises without pain, then do not avoid doing them. Strengthening your pelvic floor muscles will give your pelvic organs natural support which can reduce discomfort. You are able to use your Kegel8 electronic pelvic toner with mesh fitted, as the probe does not interfere. Strengthening your pelvic floor muscles can reduce the recovery time if you do decide to undergo mesh removal surgery. The Chartered Society of Physiotherapy (CSP) state that "there is strong evidence that physiotherapy can effectively decrease the effects of pelvic organ prolapse and can potentially avoid the need for surgery." Physiotherapist Amanda Savage, explains thats "many women don't realise that physiotherapy and supervised exercises can help, in many cases avoiding the need for surgery in the first place. I hope that there will be much better signposting for women to find their local specialist and more support for women to access them so that they can try these more natural approaches first."